Redshirt senior running back Jamal Morrow dodges a Colorado defender during the Oct. 21 game against the Buffaloes. The jovial nature of players, coaches and members of the Athletic Department this week made No. 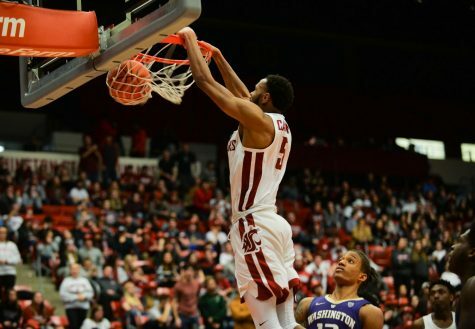 25 WSU, not 23rd-ranked Arizona, resemble the team coming off a three-score win. Head Coach Mike Leach, donning a red Cougars sweatshirt and Nike dri-fit sweatpants, cracked jokes with the small crowd in attendance for the ceremonial naming of the Gray W Jack Thompson Legends Lounge inside the Cougar Football Complex on Monday. Thompson, the former WSU quarterback receiving the honor, along with WSU President Kirk Schulz and Interim Athletic Director John Johnson, stood next to the coach and laughed. A trio of donors, with a $500,000 donation to the Athletic Department, named the fourth-floor lounge in honor of Thompson. Yet the “Throwin’ Samoan” was just as eager to build up the trajectory of the WSU football program as he was to talk about the honor. The mood around the program is odd. Eccentric, even. 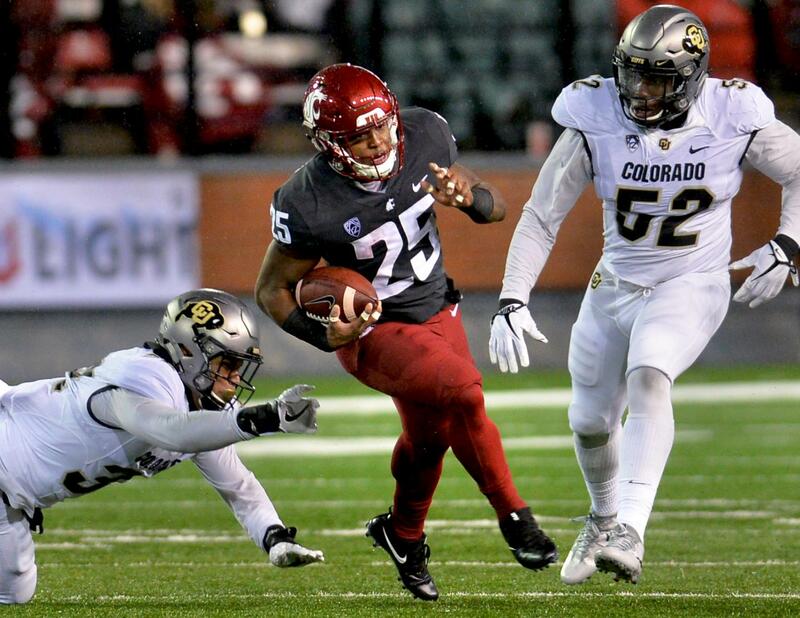 A host of sullen faces from players and a public evisceration of the team from Leach followed a 37-3 loss to California on Oct. 13. 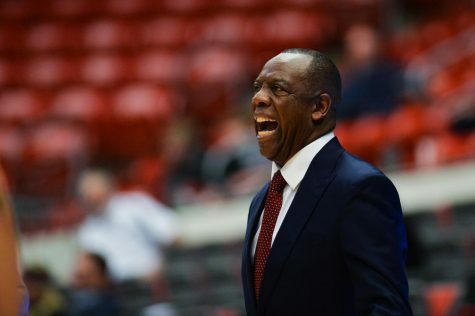 But since Saturday’s loss to the Wildcats, Leach has been calm and players upbeat. What gives? This is a program without an athletic director, skeptical on whether Leach will be in Pullman when spring football rolls around, and with issues to sort out at quarterback and in the secondary. Maybe the shift in attitudes following a loss that saw 58 points surrendered and a quarterback change midway through the game is Leach and company acknowledging they simply got beat by a red-hot Arizona offense. “Their quarterback is pretty good,” Leach said of Wildcats’ starter Khalil Tate. 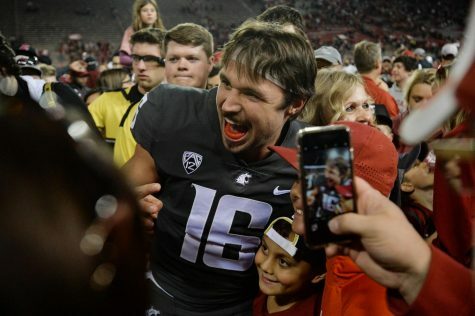 Maybe Leach’s unexpected demeanor is his attempt to keep morale high for a program facing a brutal three-game stretch to close the regular season. Tom FitzGerald of the San Francisco Chronicle asked Leach during his weekly press conference on Monday if his usual bluntness following a loss has ever worked against him. 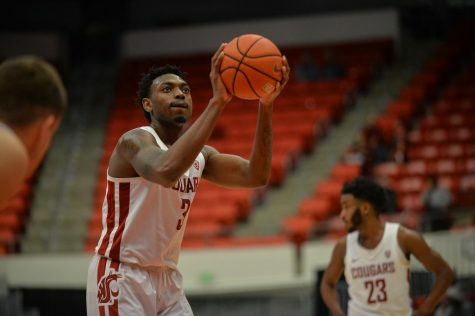 Maybe, despite Leach refusing to dramatize the festivities of Senior Day, Saturday’s matinee matchup with No. 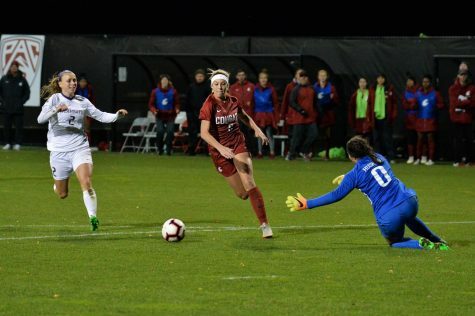 21 Stanford has prompted the program to look at where this group of fourth and fifth-year seniors has taken it. Recall that the group arrived when three-to-six-win seasons were the norm and there were plenty of questions surrounding Leach and his coaching staff. 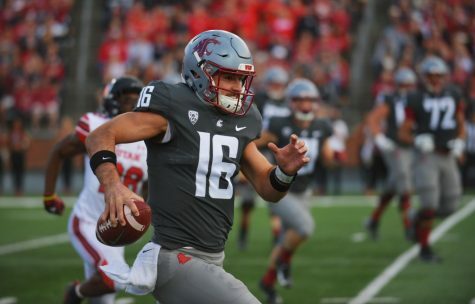 Maybe Leach and players are working to prevent redshirt senior quarterback Luke Falk, whom Leach tabbed as Saturday’s starter, from putting any additional pressure on himself after his first-half benching Saturday. “You’re talking about a guy who had kind of a longer path than nearly everybody and he’s taken it further than nearly everybody,” he said. 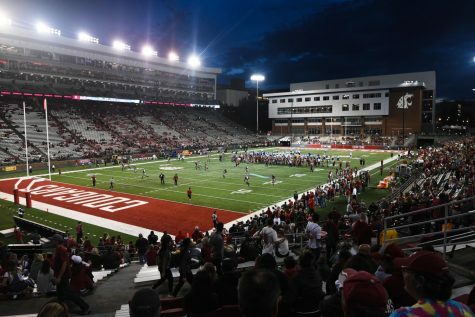 Or maybe, despite the long list of uncertainties surrounding WSU football, Monday’s naming rights ceremony, combined with what the Cougars still have left to play for and their long-term potential, caused everyone to pause and reflect on how far the program has come in a few short years. Juxtaposed with Saturday’s thrashing at the hands of Arizona were the commitments of a pair of four-star wide receivers. Johnson said there has been more than $1 million dollars donated to the Athletic Department since Moos’ left Pullman. If the Cougars win the rest of their games, they are headed to a New Year’s Six bowl game. 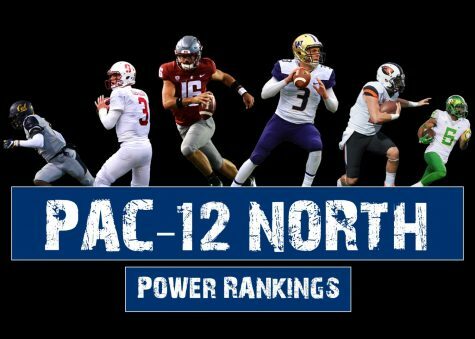 A lot of work to be done, but, for better or worse, the Pac-12 is squarely up for grabs. Assuming he returns from an ankle injury, Stanford junior running back Bryce Love and his nation-best 198.1 yards per game could have a field day in the forecasted snow against WSU’s run defense. Rice-Eccles and Husky Stadium are two of the toughest venues in the Pac-12, and are where the Cougars finish the regular season. It’s no secret that this could turn ugly three weeks from now, despite all of the opportunity at play. Talking to the Cougars, though, you wouldn’t know it.